The design of this piece is slightly different from that of the Teck tiara, which is pictured above on the Duchess of Gloucester for the sake of comparison. You’ll sometimes see the Persian tiara called the “Triumph of Love” tiara because of the various symbols incorporated in its design, including laurel wreaths and lovers’ knots. 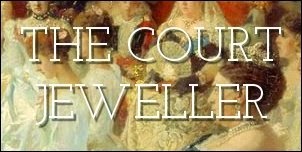 In 1923, George V gave the parure as a wedding gift to his new daughter-in-law, Lady Elizabeth Bowes-Lyon. The tiara was originally a kokoshnik, but Elizabeth had it altered by removing the top row of diamonds. She was photographed in the turquoise set, but the piece was never one of her most-worn tiaras. In 1951, Elizabeth (who was now queen consort) gave the entire parure to her younger daughter, Princess Margaret, as a twenty-first birthday present. After the Poltimore, the Persian tiara was the largest piece in Margaret’s collection, and she wore it frequently at white-tie events with pieces from the coordinating parure. When Margaret died in 2002, a great number of her jewels were auctioned to pay death duties, but this tiara was not included in the sale. There’s been much speculation about who owns the tiara today. Some think it is with one of Margaret’s children, while others have suggested it might have returned to the royal collection. The hopes that Margaret did indeed have the turquoises returned to the royal vaults gained even more traction when the Duchess of Cambridge wore another of her tiaras, the Lotus Flower Tiara, in December 2013. Let's hope that the turquoises are just waiting for another royal lady -- maybe Kate? -- to wear them once more!